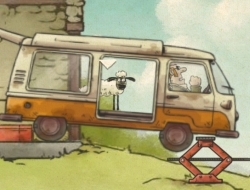 These poor sheep are lost and they want to reach London. Each one of them has some unique qualities, the bigger one can smash through things the other two cant, so try to use it as a leader. The small one is very fragile and light, but she is very good for going through tight spaces and using switches to open doors for the others. Finally, the medium sized one is a combination of the other two and she is very athletic. Try to use them in the right situations and always try to collect the socks. There will be hidden achievements available give it your best to find them out or you will be missing out on a lot of points. Home Sheep Home 2 10.00 between 0 and 10 based on 1 votes.